I customized my camera, computer bag yesterday; this is the best bag I have ever had to carry camera, computer, batteries, umbrella and bread or other assorted things along the path. I am having the camera bag sown into the bag, creating a small extra padded pouch that can hold the camera inside the bag, keep it at the top, allow it to breathe and allow me to quickly pull of the bag and put back in the bag without a problem. 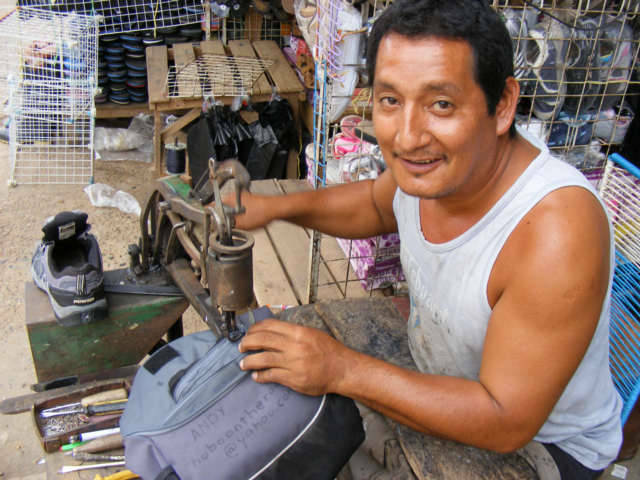 South America is a good place to alter a backpack, to customize, to change and get it up to speed. Why? 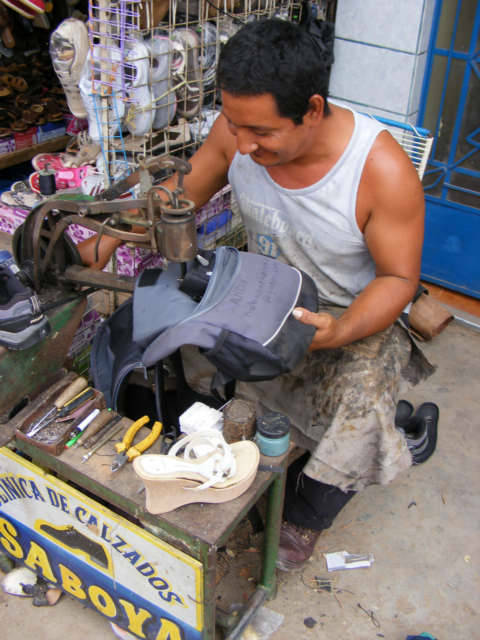 In Asia, they wear sandals; they do not have many shoe repair places, while I have found at least five in the city of Pucallpa without looking. If I can find some mesh? Oops, I know where some is, the rather worthless mesh on my Kelty Backpacks, I can scavenger off the bags and make a mesh side panels or air flow method for the bag. I have some mesh, I can take this mesh material from another backpack now and install window of mesh so the air can enter or leave the bag. I want it to breath and allow the camera to acclimate to the outside air, I think I will also make a solid cover that cover the mesh, maybe I can figure out a way to make a small backpack cover to pull out and cover this bag. I have one of them I can modify also, for my other bags, the camera bag that also holds a computer is much more important. I also could install a strap to secure my umbrella better, the mesh pockets on the side of the bag are wearing out, stretching and really just decorative, I am not a big fan of mesh pouches. I often wonder what bags are on the market that I could just buy, if there are any bags that truly allow me to use my bag properly as a photographer. I do not want my bag to look like either a computer or camera bag; I do not like to be a soft target, like many wankers walking around with their cameras around their neck. I do thank them for having their camera stolen, making my life by default easier. I put my large, completely waterproof, no joking poncho down in the computer pouch to take this boat trip to see the Missionaries. This is a great location for the poncho, now if I had to computer pouches I would be ready for a bear of rain. Jungle and taking photos is myriad of water problems, my room here in the Komby for 10 U.S. is not air conditioned, but has the standard too noisy old ceiling fan, not my first choice in fans, but the room is nice. If I had air conditioning, I would hand the bag in the window under the curtain to allow to be outside, yet in the room. With a few more modifications, I could maybe get this bag up to rough travel standards. I have a great new system for batteries, I have five extra sets now, I can take photos for about two weeks off the grid, maybe about 1000-1500 photos without needing to recharge. This is the shoe repair person, he refused to be paid, said to buy him a beer. I am really happy with the city of Pucallpa, it is my type of jungle city, everyone is helpful, they really do not know Tourist, contrary to the city of Iquitos where there is always a jade by the tourist person walking around who wants nothing to do with you. The Belen part of Iquitos is great; however, the whole city of Pucallpa has the Belen hospitality and not the tourist trap mentality. NOTE: Notice the long protruding small bottom part where normally there would be a bobbin, this allows him to sew up the bag better. It is helpful to find this type to have a backpack repaired. I sometime use fishing line or net repair line to fix my bags, sewing them up by hand.